Via Rainbow River. Climb a broad, scrubby ridge from the junction of the north and south branches of the Rainbow, then sidle along a shelf (great campsite) and diagonally up narrow exposed platforms to a col north of the peak. 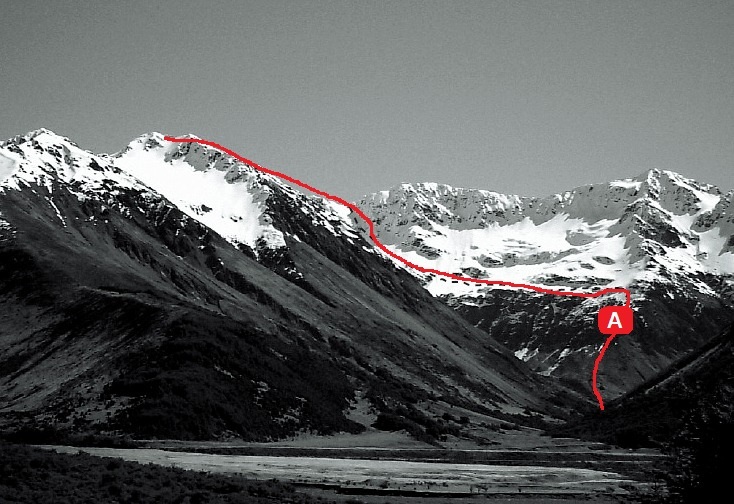 Follow the range to the summit. Beware of avalanches on all slopes. Without crossing the swingbridge, follow the old track on the true left. From a large boulder at the southern end of the large clearing east-southeast of Mt Franklin, climb through forest to the bushline. Sidle upwards, crossing into a basin with a large tarn. Climb scree towards a col north-east of Mackay (map ref. M30/878040), and along the ridge. A steep ridge rising from the northern pass (see route 6.06) can be bypassed via gullies falling to the source tarn of the East Sabine. Climb a large couloir at the head of the tarn, up a rock step and onto Peak 2180m. Gendarmes on the narrow main ridge to the summit can be sidled or climbed over.